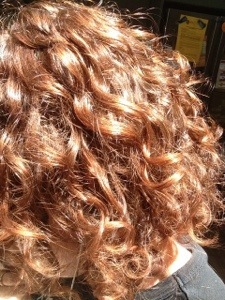 It took me most of my adult life to come to terms with having naturally curly hair. It’s one of those silly female things, isn’t it? Oh, I’d rather have your hair, yours is beautiful, so easy to manage, oh but YOURS is so lovely! Blah blah blah. Curly hair is a nuisance, it’s never the same two days in a row and it takes a lot of effort to make it look anything other than a fuzzy mess. I thought I’d share with you what I’ve learned. The most important thing is you need a good hairdresser. Curly hair is difficult to cut, you need to understand that if you snip a little bit off that piece in front it will spring up into a lopsided pompom and sit ridiculously on the right corner of your forehead. You need to realise that it will behave differently at different lengths and in different climates. I was introduced to my hairdresser by a friend with an immaculate blond bob who’d had a longer relationship with her hairdresser than she’d had with her husband. This hairdresser not only understood curly hair, his partner had it herself and even let him experiment on her. Sometimes. I have occasionally strayed from his ministrations, tempted by a voucher or a special, but have always needed to call him in for repair work afterwards, and have learned my lesson. The next thing is that you need to listen to your hairdresser. I would very much like to have long curly hair, but Gary tells me my hair just isn’t interested. It gets to a certain length, then snaps off in a spray of split ends. Doesn’t matter what nourishing serums I put in it, a bit longer than shoulder length is all I’m going to get out of it. It also looks neater when dyed all the same colour. Because of the dry ends business the natural colour of my hair goes from quite dark brown at the roots to a sandy ginger in the middle and blond on the ends, with some grey sprinkled around the front. A uniform coppery tint makes it look a lot less like something found atop an art teacher. You will need product. Sometimes more, sometimes less. You will probably also need to blow dry if you don’t want it to sit flat on top and radiate out in a triangle shape like that woman in the Dilbert cartoon. A gentle heat and speed, a little bit of upside down and some scrunching with the fingers is what works best. I use Sebastian Potion Number 9 if I just want no frizz and a weightless product. Revlon Vinyl Twist gives more defined curls, but a slightly sticky finish. It’s good for if I want to go out with curly hair, rather than exasperatedly twisting it up with a clip. Schwarzkopf Silhouette is very good at smoothing down fuzzy ends, but does have an unfortunate tendency to make you smell like your grandma. You only need a tiny bit. I also really like tec texture shine, but they were taken over by L’Oreal some time ago and I’m going to have to make the smudge I have left last. if I wanted it to makes me a lot less likely to risk my marriage by cutting it all off.